State lawmakers will recognize the Hawaii Academy of Science on the 50th anniversary of the annual State Science and Engineering Fair. But it could be the last science fair if the Legislature does not approve a request for a two-year grant of $500,000, academy officials say. The Legislature had allocated about $100,000 a year to the academy, routed through the Department of Education, said University of Hawaii education professor Irv King, academy education committee chairman. When the DOE adopted a new budgeting formula, the science fair money went to the schools, leaving no money for the fair, he said. A rainy-day fund is being used for the science fair April 2-4 at the Blaisdell Center exhibition hall, he said. Iris Terashima and Dr. Neal Atebara are among many thousands of former students whose careers were influenced by the science fair. "For Hawaii not to have a science fair would be a complete travesty," Atebara said. Noting the state's goal to develop a more technology-driven economy, the Honolulu ophthalmologist said that "to have the science fair not continue would be such a big statement about where our priorities are." Atebara, 42, graduated from Waiakea High School on the Big Island in 1982. "Hilo was not really known for great opportunities in science back then," he said. He was fortunate to get research time on the United Kingdom Infrared Telescope on Mauna Kea for a science project looking at planetary nebula near the Orion constellation. When he came to Honolulu for the science fair, he said he told his mother not to attend the awards ceremony because he was not going to win. But he and two high school friends all won awards, he said. "It was a neat thing." Terashima went to Northwestern University after winning scholarships at the state and international fairs in 1981 with a project involving development of ethanol from Waialua Sugar Mill waste. "It's funny how things become relevant again," she said. Her experience at the science fairs cemented her decision to pursue a career as a chemical engineer, she said. She is now manager of the federal programs division in the Pacific for URS Corp., a worldwide engineering firm. The former Waialua High School student said the science fair gave her an opportunity to compete at the state and international levels. Coming from a small town, she said, "it was a big deal. ... Enough folks were willing to invest in young, budding scientists like myself. It was a tremendous opportunity. "It gave me the sense that it didn't really matter where you came from, if you had the right support from folks and willingness to pursue your dream." 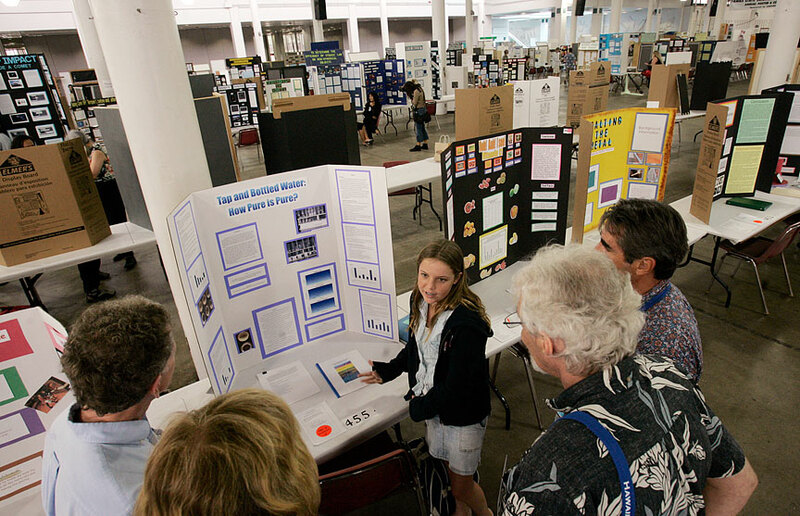 About 6,000 private and public school students participate annually in school science competitions and progress to district or state fairs. Winners compete in the International Science and Engineering Fair. Thousands of dollars are awarded in cash and scholarships. "There is a misconception that the science fair is a Department of Education project," said Katherine Aratani, who retired in 2001 as the fair director but returns each year to help out. "It never has been, and is not now, a DOE project. It has always been a project of the Hawaii Academy of Science, which is not really known." » Astronaut Ellen Baker and a full-scale mockup of a space shuttle flight deck will headline the opening ceremony. » The Hawaii Academy of Science is seeking former student participants and state and district fair directors to attend the event from 5 to 7 p.m. in the Neal Blaisdell Center exhibition hall. Call 956-7930 or e-mail acadsci@hawaii.edu for an invitation. 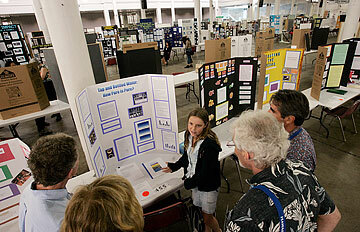 » Slides of students with their projects at past science fairs will be shown at the ceremony. » Gov. Linda Lingle is expected to be one of the celebrity judges April 3. The fair will end with an awards ceremony April 4.